When it comes to blame and logic, it may be more useful to understand the system rather than the individual. The following is an excerpt of The Art of Logic in an Illogical World by Eugenia Cheng. If factors A and B cause a situation, which is to blame? We now know that to negate an “and” statement we only have to negate one of the individual statements. This means that just one part could be to “blame” for the statement being false, although both of them have to contribute to the statement being true. A: I dropped the glass. B: The floor was hard. It is the combination of those two things that caused the glass to break. Now, if I hadn’t dropped the glass, it wouldn’t have broken. But also, if the floor hadn’t been hard, the glass wouldn’t have broken. Negating just one of those factors negates the statement “A and B”, but it doesn’t mean that one of those factors is to blame by itself. It is the combination that is to blame. A is false or B is false or C is false or D is false. That is, negating any one factor negates the whole statement. So for example, if you are not a straight, white, rich, cisgendered male person, it could be because you’re not straight, not white, not rich, not cisgendered or not male. Losing any one of those privileges would mean you don’t have the full complement of these types of privilege, but it doesn’t mean that one of those privileges is more “to blame” than the others if you do have all that privilege. This is a subtle point but a crucial one, I think, when we are considering who or what is to blame for something. For the student failing the exam we could also consider a lot of other factors: the exam was hard, the examiner was not lenient, the pass mark was set high, the student was sick that day. It is always easy to blame just one of those factors, on the grounds that changing one of them would have changed the result. But it is always the combination of those factors, joined by the logical connective “and” that actually causes the result. I heard an interesting talk by software developer Jessica Kerr who summed this up as understanding the system rather than blaming the individual. So, instead of arguing about trying to attribute blame individually, it is more productive to understand how the system makes all those factors interact with each other to cause that outcome. One of my favorite examples of this is from An Inspector Calls by J.B. Priestley. A woman has been found dead, and gradually more and more people are found to be implicated in her demise, in different ways, from personal to professional to incidental interactions. They all start arguing with each other about who is really to blame, when in fact it is an “and” situation. The mother and the father and the son and the daughter caused the situation between them, together with society and the world. Perhaps also it is an example of what Jessica Kerr said about understanding the system. Here there are two systems: The family and its interactions (for example, where Eric says “You are not the sort of father a chap could go to when he’s in trouble.”), and society and the way it treats poor women. 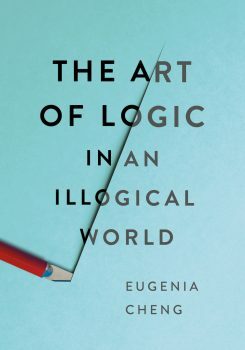 Excerpted from The Art of Logic in an Illogical World by Eugenia Cheng, with permission from Basic Books, an imprint of Perseus Books Group, an imprint of Hachette Book Group. Copyright © Eugenia Cheng, 2018. Dr. Eugenia Cheng is Scientist in Residence at the School of the Art Institute of Chicago and author of several books, including Beyond Infinity: An Expedition to the Outer Limits of Mathematics (Basic Books, 2017) and The Art of Logic in an Illogical World (Basic Books, 2018).